If you prefer doing the yoga asanas in a dynamic way, this power yoga sequence is just for you! Adriene will guide you through the sequence combining deep stretches with vigorous movement. This power yoga sequence gives you all you need for your body – complex stretching and the great workout for all the most important muscle groups. Making your body warm, it allows you to work on your flexibility on a different level than while performing calm and static asanas. Both the beginners and the more advanced yogis will enjoy this power yoga class. You will leave the class all sweaty and tired, but happy and joyful! 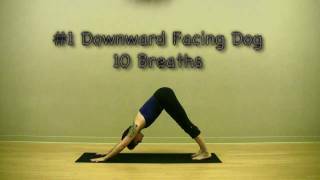 Other recommended power yoga video by Ali Kamenova. Here’s What Bikram Yoga is! !